The music of Broadway is one of America's most unique and popular calling cards. 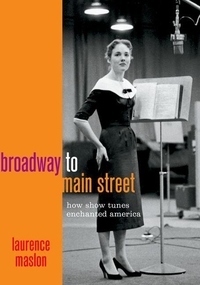 In Broadway to Main Street: How Show Tunes Enchanted America, author Laurence Maslon tells the story of how the most beloved songs of the American Musical Theater made their way from the Theater District to living rooms across the country. The crossroads where the music of Broadway meets popular culture is an expansive and pervasive juncture throughout most of the twentieth century--from sheet music to radio broadcasts to popular and original cast recordings--and continues to influence culture today through television, streaming, and the Internet. The original Broadway cast album--from the 78 rpm recording of Oklahoma! to the digital download of Hamilton--is one of the most successful, yet undervalued, genres in the history of popular recording. The challenge of capturing musical narrative with limited technology inspired the imagination of both the recording industry and millions of listeners: between 1949 and 1969, fifteen different original cast albums hit number one on the popular music charts, ultimately tallying more weeks at number one than all of the albums by Frank Sinatra, Elvis Presley, and The Beatles combined. The history of Broadway music is also the history of American popular music; the technological, commercial, and marketing forces of communications and media over the last century were inextricably bound up in the enterprise of bringing the musical gems of New York's Theater District to living rooms along Main Streets across the nation. Featuring new interviews with Stephen Schwartz, Chita Rivera, Steve Lawrence, and prominent record producers and music critics, the story of this commercial and emotional phenomenon is told here in full--from the imprimatur of sheet music from Broadway in the early 20th century to the renaissance of Broadway music in the digital age, folding in the immense impact of show music on American culture and in the context of the recording industry, popular tastes, and our shared national identity. A book which connects cherished cultural artifacts to the emotional narratives at the core of American popular music, Broadway to Main Street: How Show Tunes Enchanted America is an ideal companion for all fans of American musical theater and popular music.